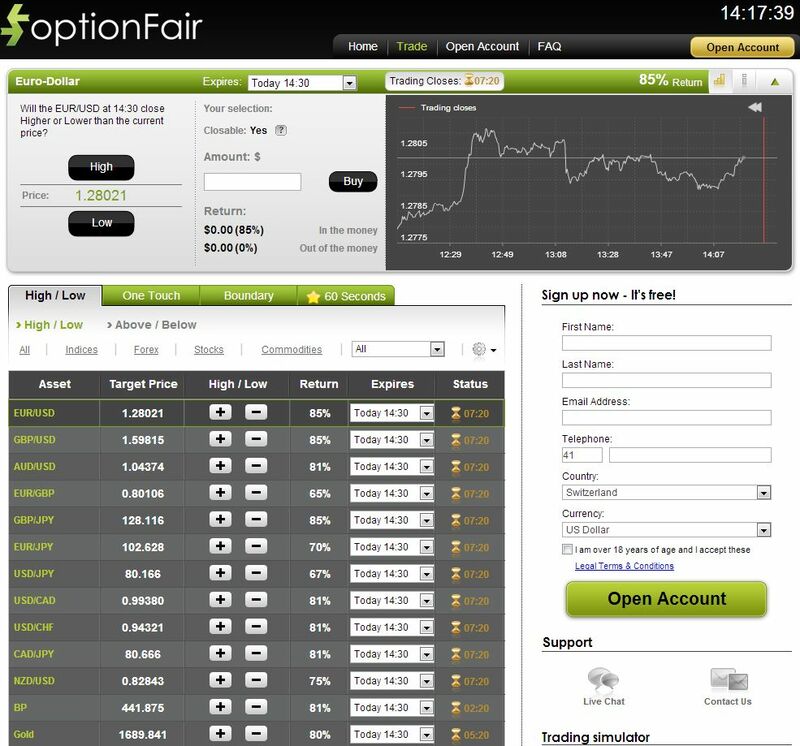 optionFair is one of the world’s leading Binary Options brokers. The website and the trading software are available in 14 different languages, which shows that this broker is operating on a global scale. The broker is part of Mika Holding, which is owned by a group of experienced investors in the areas of foreign exchange and equity trading. While Mika Holding is based in the British Virgin Islands, optionFair has offices located in the European Union, in Cyprus. Like all providers of digital options, also this broker is relatively young. But compared to other brokers optionFair can already be called an established company. The website was launched in 2009 and is now one of the 60,000 most visited sites worldwide. optionFair offers the three typical types of binary options. Because trading takes place entirely in the browser, no prior installation of a program is necessary. Therefore, it is also possible to trade options on a Smartphone / iPhone or on a computer without administrator rights. At optionFair you can trade high / low, one touch and boundary options. All available options have a duration of less than a half hour. It is also possible to enter into ongoing options so that the average duration in this case is only a few minutes. In addition, optionFair offers 60 seconds options on selected currencies, indices and commodities. With such highly speculative options it is possible to achieve a profit of 70% in just one minute. optionFair is perfect for beginners because the minimum amount a trader must invest in an option is just 25 dollars (or Euros, depending on the currency of the account). The maximum amount per trade is 15,000 U.S. dollars. You can chose from roughly 50 different options from the asset classes Forex, stocks, indices and commodities. Forex: There are 60-second options on EUR / USD, GBP / USD, USD / JPY and EUR / JPY. In addition to this, you can trade options with a duration of 20 minutes on 15 different currency pairs. These options can also be purchased up to 5 minutes before expiration time. Stocks: Here you can chose from more than 20 different stocks such as Microsoft, Apple, Google and Facebook. Indices: About ten different options on indices are available at optionFair. These include the popular indices such as Dow Jones, Nasdaq and the German DAX-index. Commodities: Regarding commodities, the choice at optionFair is limited. However, this is the case with the other Binary Options brokers as well. Besides the standard options on oil, gold and silver you can also trade 60 seconds options on oil and silver. For options which end up in the money (ITM) optionFair pays out up to 85%. This is the case for the most common currency pairs like EUR / USD, GBP / USD and GBP / JPY. If the option is out of the money (OTM) you will get back up to 15% of the amount invested. By clicking on a value in the trading software you can see immediately the payments ITM / OTM. Because the payouts can change and because different underlying assets have different rates, you should always check the return percentages before investing in an option. The information about “in the money” and “out of the money” returns is displayed prominently on the trading platform. The minimum deposit via credit card or via Skrill (formerly Moneybookers) at optionFair is $ 200 (or € 200 if you choose Euro as the account currency). This is an average amount in comparison to other brokers and in our opinion still an acceptable amount for beginners. Other depositing options require higher minimum deposit amounts (wire transfer: $ 500, Western Union: $ 1,500). The minimum amount for withdrawals is $ 100. For safety reasons, withdrawals are made to the same account that was used to make the initial deposit. If this is not possible, then the profits will be transferred to the bank account of the trader. One withdrawal per month is free of charge, and additional withdrawals in the same month cost 30$ each. Compared to other brokers, optionFair offers a wide range of payment options: credit cards (Visa, Master Card), Liberty Reserve, Western Union, wire transfer and the popular Moneybookers (now Skrill) are some of the ways to deposit or withdraw funds at optionFair. optionFair has a detailed online help function and a FAQ. In addition to this, they have a live chat support in seven different languages. The customer support can also be contacted by email and by phone (at the time of writing: in English, Spanish, Italian, French and Arabic language). Due to regulatory changes by Cysec, optionFair is no longer allowed to offer deposit bonuses at all. optionFair is a very good choice if you wish to enter world of Binary Options trading. Trading is very easy to learn and the payouts of up to 85% are high. Thanks to the low minimum investment of $ 25 per trade also beginners who want to risk only a small amount of money can start trading here.